If you look at technology, you can tell that there is a lot of competition between various manufacturers. It appears as if there is the same type of competition in the instant messaging arena. Two of the competitors that have appeared on the horizon are Samsung and Apple. 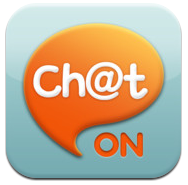 Samsung has now taken this instant messaging application ChatON and put it into the Apple App Store. What is really interesting is that it now competes with Apple's instant messaging app iMessage. The Samsung messaging app is now available for the Androis smartphone operating system. Other customers including Windows Phone 7 and the BlackBerry users may flock to use this so that they can stay connected with their friends, families and co-workers when they are working on the computer. If you look in the Apple app store, you will see that ChatON has been described as a Global Mobile Communication Service that will allow you to have and maintain your relationships with your friends, your family and even your work buddies. You can now see a service that brings communication lines, expressions lines and sharing with others all in one location. You can message as an individual as well as get a group of friends together in a group chat. The application also lets you broadcast messages. If this sounds like something that you might want to make use of, you should try it. Do you talk to your friends a lot? Are you interested in getting your family together to talk even if they live in several different states? This can easily be done with the ChatON application. This application can also be used in a work situation. Do you have several employees across several offices in various states? Why not get them all together on a group chat? Do you need to talk to a client. If so, then go ahead and use the one-on-one capabilities that are offered with the ChatON application. 0 Respones to "ChatON App Now Available in the Apple App Store"